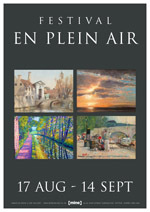 An Open Exhibition for artists who specialise in painting directly from life - en plein air - in the open air. A catalogue will be available to download from our website after the second weekend of the show. Artists are invited to submit a maximum of three works for the exhibition painted en plein air and covering a range of subject matter including landscapes, seascapes and urban and rural scenes from across the UK and abroad. Deadline for Artists submissions: 4pm Saturday 10 August 2013. Artists participating in the exhibition are invited to come down to the gallery on the opening weekend, the 17 and 18th August to paint 'en plein air' in and around Carshalton village and the surrounding areas. There is a wealth of subject matter for participating artists to choose from on the doorstep of the gallery including the conservation area, historic ponds, All Saints Church, Ecology centre and allotments, the River Wandle and local lavender fields (subject to late season), parks and open spaces. Paintings of the local area completed on the opening weekend will be made available for sale during the exhibition subject to the agreement of the artist. Car park: Directly opposite gallery on Carshalton Village high street which forms part of the A232 between Sutton and Wallington. If you would like to join the mailing list for the gallery and receive invitations to our private views please contact Andrew at [mine] on 020 8647 1800 or click here to sign up to the mailing list online. Sunday 15 September between 12noon and 4pm. > minimum sale price for work accepted will be £50. > the gallery does not provide insurance cover for the works during the exhibition.